On Sunday, Attorney General William Barr released his summary of Special Counsel Robert Mueller’s inquiry into alleged Russian interference to boost Donald Trump in the 2016 elections—a report that states it took “19 lawyers who were assisted by a team of approximately 40 FBI agents, intelligence analysts, forensic accountants, and other professional staff,” 2,800 subpoenas, nearly 500 search warrants, and hundreds of records requests and witness interviews to assemble, resulting in a slew of indictments. Barr’s summary, which mostly concerns the immediate implications for Trump and states there are no further planned indictments, is... four pages. There are two sections to the report, which was feverishly anticipated because of the possibility it could include some sort of smoking gun implicating Trump in election shenanigans. The first of these sections focuses squarely on the alleged Russian operation, including the now-notorious, Saint Petersburg-based Internet Research Agency (IRA) social media “troll farm” and successful attempts to break into Democratic Party and Hillary Clinton campaign-affiliated computer systems. As far as updates go, this one basically says, “No collusion!” There’s no explanation of how Mueller’s team determined that no “U.S. person or Trump campaign official or associate” was knowingly involved in the IRA efforts—which more or less entailed dissemination of disinformation and propaganda on U.S. social media. (Admittedly there was never any evidence of this, beyond speculation and some shared messaging tactics.) The “knowingly” part may be a reference to Richard Pinedo, a man charged with identity fraud for selling dummy bank accounts to Russians that later bought Facebook ads. What’s likely to be more contentious is how Mueller determined Trump or his associates had no direct connection to the hack of Democratic email systems, given the alarming degree of contact campaign associates had with Russian actors, the candidate’s efforts to secure a Trump Tower Moscow deal, and how Trump himself challenged Russia to hack Clinton. Mueller’s investigation into the hack resulted in several related indictments. These mostly concern Russians who will almost certainly never be extradited, but Trump associate Roger Stone was charged with lying, obstruction, and witness tampering amid the investigation into his contacts with Wikileaks, which the feds allege the Russians used as a conduit to release the hacked material. Trump’s son, Donald Trump Jr., also met with Russian lawyer Natalia Veselnitskaya in 2016 to obtain dirt on Clinton as part of what she described as “Russia and its government’s support for Mr. Trump,” as well as traded messages with Wikileaks founder Julian Assange—neither of which is a crime in and of itself, and in the latter case seems to have mostly involved Assange begging for an ambassadorship. Regardless, all these factors have added to countless months of public speculation. In other words, there’s smoke, but Barr is insisting that Mueller’s investigation revealed no underlying fire. That may well be true, but it would be nice to know how they verified nothing is burning. Mueller may have also reported other as-of-yet-undisclosed details that would be politically embarrassing for the president but fell short of illegal coordination or collusion; if so, Barr chose to leave them out of his book report. Trump’s triumphant supporters notwithstanding, we don’t yet know what that means. When prosecutors say that an investigation “did not establish” something, that doesn’t mean they concluded it didn’t happen, or even that they don’t believe it happened. It means that the investigation didn’t produce enough information to prove that it happened. Without seeing Mueller’s full report, we don’t know whether this is a firm conclusion about lack of coordination or a frank admission of insufficient evidence. A number of other people have been charged as a result of the investigation, including former Trump campaign manager Paul Manafort, aide Rick Gates, former National Security Adviser Michael Flynn, and novice foreign policy adviser George Papadopoulos. In the case of Manafort and Gates, those charges involve financial crimes and unregistered lobbying for Russian-allied politicians in Ukraine, but do not appear to be directly related to domestic election interference. Flynn lied to the FBI about contacts with Russian officials and lobbying work on behalf of Turkey, but similarly has not been charged with anything related to the IRA or hacking. Papadopoulos also lied to the FBI about contacts with Russians, this time in relation to rumors he had heard they had Clinton’s emails, but was not charged with any active role. Broadly speaking, this is not good news for Democrats convinced that Trump connived with the Russians to steal the presidency. 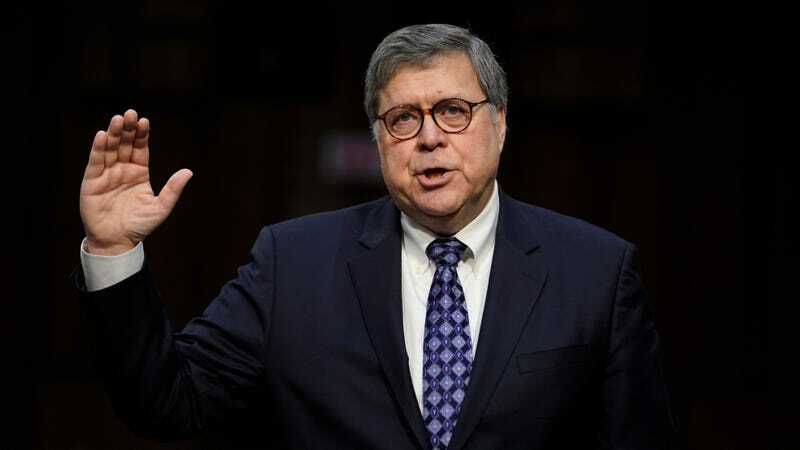 But it’s worth noting that Barr’s appointment to head the Department of Justice earlier this year was the subject of concern from Democrats who were wary that he might do his best to suppress the findings of Mueller’s report. This four-page summary is not exactly reassuring that he is being entirely up-front about what the full document says, and in Barr’s conclusion, he noted that he will have the authority to determine what to disclose and when.